The NOOK Tablet’s high-resolution, full-color screen is quite capable as miniature TV, although the screen size is obviously more suited for solo watching up close. Visit websites that offer free video on demand. These include sites like YouTube, computer and electronics review sites like CNET, and TV networks like NBC. For best results, choose a file intended for a tablet. Subscribe to services like Hulu Plus and Netflix. Watch videos that you’ve side loaded. The videos may be ones you took with your video camera or cellphone, or they may be works you got (legally). Transfer compatible video files from a personal computer using the USB cable; follow the same instructions you would for transferring music and audio files. The best quality videos are in MP4 and M4V file formats. Other acceptable file formats come from the smartphone world, including 3GP. 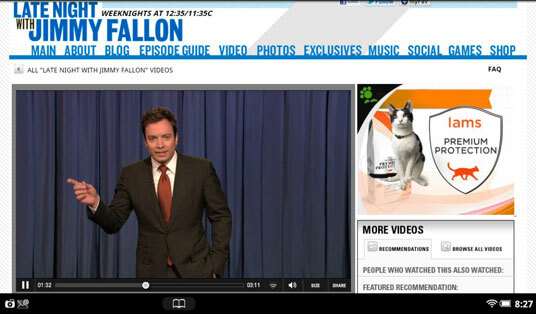 To play a video that you’ve loaded onto your NOOK Tablet, find and tap it. (One route: Tap the ∩ button; tap Library, and then tap My Stuff. Find the file in the Video or Downloads folder.) If you try to play a file that isn’t supported, it won’t play. In most cases you can’t enlarge a video that you’re playing from a file that’s stored on the NOOK Tablet; the pinch-out gesture may work with some streaming video websites, though. Hulu Plus brings current and older TV shows, and some movies, to your tablet over the Internet on a monthly subscription basis. Shows generally have limited advertising. Hulu Plus and Netflix videos are streamed to your device and not stored on it. The only way to watch television shows or movies offered by these services is with an active WiFi connection to the Internet. Netflix is one of the main providers of streaming video (and they’re streaming to everything from PCs to Internet-connected TVs, to handheld devices — including your NOOK Tablet. You can sign up for a monthly subscription. Netflix shows only in landscape mode on the tablet, and offers thousands of movies. Not all of the Netflix library is available to stream; some are offered only in DVD form.